Home »Unlabelled » Singapore iPhone 4S Apple Online still "Currently Available". Why? Singapore iPhone 4S Apple Online still "Currently Available". Why? 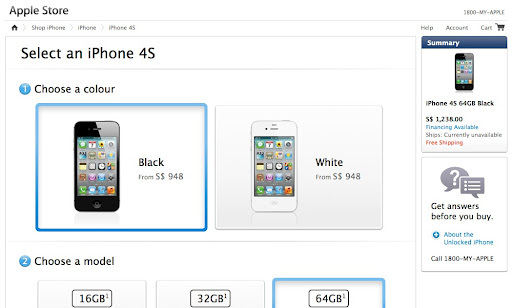 The iPhone 4S is now formally on sale in 22 more countries, following an expansion of preorders exactly a week ago. For the time being Apple has adopted a European focus; new regions include Austria, Belgium, the Czech Republic, Denmark, Estonia, Finland, Hungary, Ireland, Italy, Latvia, Liechtenstein, Lithuania, Luxembourg, Mexico, the Netherlands, Norway, Singapore, Slovakia, Slovenia, Spain, Sweden and Switzerland. More regions should be added over the course of the next several months. Apple’s shipping times for most countries are still said to one to two weeks. I have been waiting to order from Singapore since I missed the pre-order boat on 21 Oct.
Not sure when SG Apple Online Store will be open again for iPhone 4S orders.